I would never make much of a business person, but I love the books – they’re like reading adventure tales to me. (I’d never make much of an adventuress, either.) And because I was so interested, or maybe Stone is a really good writer, it took longer to finish because I was reading, occasionally rereading, every single word, And I was sad when I finished – no more book? Stone gives us the mesmerizing story of how the brilliant and intensely competitive Jeff Bezos created, developed and now manages Amazon.com -as in the eponymous title. Being a long time and heavy user of Amazon for books, and as a reader of good business/economics articles and books, I was understandably interested from the gate. Bezos is portrayed as both hero and villain here (at least that’s my take) and it takes folks like that to forge businesses like Amazon (or Microsoft, Apple, Intel, EBay, Google, etc) and there are vey few of them around. Their exploits make for good reading, though. The basic story is fairly well known. Bezos, a finance strategist on Wall Street, and his wife took their savings, borrowed a car and drove across country to Seattle to start a bookstore online. 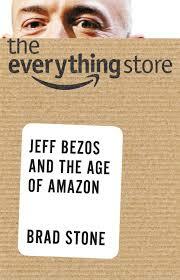 Bezos was a voracious reader but he wanted a lot more than a bookstore, and there’s a lot more to that story. Even Amazon was basically up and running, there were hurdles including skepticism on the part of the brick-and-mortar community as well as business analysts. This is to say nothing of the logistics, process and systems issues, finance troubles and, of course, the personality, frugal to the point of almost miserly, breathtakingly creative, perfectionist and temperamental, of the big boss himself who was/is driven almost entirely by keeping the customers happy. And Bezos’ big and long-range competitive thinking got him into plenty of trouble with both employees and competitors, but very rarely the customers. All this makes for more good reading. The end question, food for thought, is Amazon primarily a missionary organization or a mercenary one? Is the goal really customer satisfaction, or is it the almighty buck? – Stone says both – the book shows both. When an entrepreneur starts out he either wants to bring a great product to the people, or he simply wants to make some bucks. I think that Amazon is about as missionary as a for-profit company can get, but the point is winning and the power which will accrue. Bezos just wanted to get his own WalMart online – he didn’t love books all that much, and he wasn’t in it for the money. It was all about the challenge, and catching the customer was the m.o. That’s my take snyway. Stone has a very engaging and sometimes humorous style which moves the story along at a nice clip. He did an extraordinary amount of research and it’s used well.